I'm trying to estimate the parameters of an Ornstein Uhlenbeck process for a risky asset using the Kalman Filter but have doubts about the state space formulation that I am using. Also, though the optimization routine usually converges, it is not producing consistent results (I seed it using random values of a0). 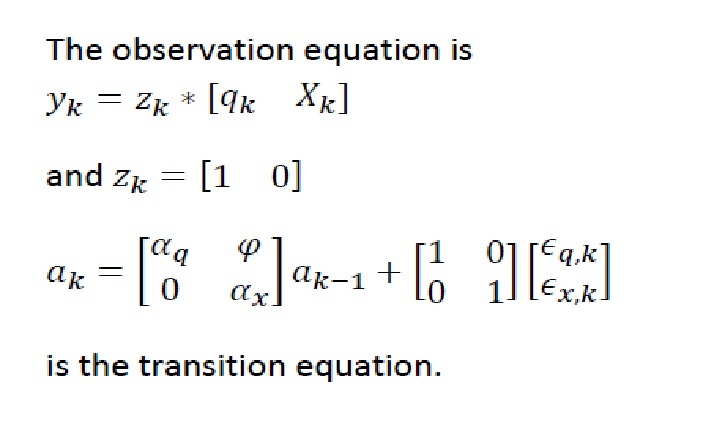 I set out the state space formulation below and a sample of the results that I've obtained. I'd be grateful for comments. Note that the Xk series is not observable in the case that I am considering. We've around 200 observations of returns in the qk series which are the result of taking the log of the original price series and removing the mean. Question: Does this look right to you? I've used the R FKF and optim routines but do not seem to get stable results. Obviously, apart from the stability problems, we have a problem with negative values of the sigmas, which are the volatilities of the process. The Hessian is used to determine the confidence intervals for the estimates, and it is such that there are NaN's for some confidence intervals. However, that is not the focus for the moment. Question: Any comments on these results and what might be going wrong? The FKF package in R seems to force one to use the cumbersome formulation that I set out at the top. Matlab allows the briefer formulation set out immediately above. Simulating the process from the sse above and then trying to fit it is a useful way of diagnosing problems. For the values I've investigated, the Kalman Filter with MLE methods did not work properly, either with R's FKF or Matlab. Not the answer you're looking for? 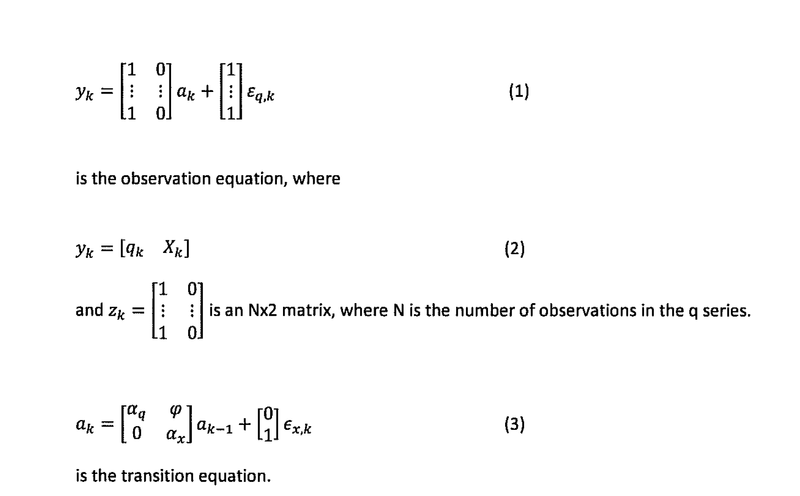 Browse other questions tagged stochastic-processes stochastic-calculus kalman or ask your own question.